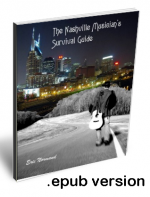 So You Want to Know More About the Music Biz 'of Nashville? Buy the book and the CD together and save $2.50 ! Buy the book and the CD together and save $5.00 ! Buy the book AND the Kindle Version and save $4.99! Buy the book AND the ebook and save $4.99! Download The Nashville Musician's Survival Guide for your ebook reader.Compatible with any reader which uses the .epub format; including Android devices, Barnes & Noble Nook, iPad, iPhone, Kobo Reader and Sony Reader.